The Cicerone guide book I have suggests that the gradient to begin this day is more difficult than Les Houches to Col de Voza but I am inclined to disagree. The route to Col du Bonhomme is long and fairly challenging (especially with a 15kg bag on your back) but the way is varied and feels more like a mountain path. Whilst still steep, there are steps up's, protruding rocks and Roman slabs to maneuver your feet around thus making the walk interesting and less demanding. The route from Les Houches on day one is simply a road on an incline. Not good for the feet. As you rise up through the valley the eyes set view upon two refuges, the second of which is called Chalet la Balme which serves a nice cup of tea with a great view down from where you just walked. This is well worth a stop considering the next leg of the journey is considerably more challenging. Leaving Chalet la Balme behind and feeling refreshed from the tea, the track continues to rise more steeply to the top of Col du Bonhomme. The view from here is arguably the best of the day and a great stop for a picture. Our picture was taken by a lad we met at the top named Dustin who turned out to be just one of the friends we made during the ten day hike. Admiring the view from every angle there are two paths to take from Col du Bonhomme, one to the right and one to the left. The left path is the one to take and it continues immediately uphill to the next Col - Col de la Croix. By the time the second Col is reached, you've gained 2500m of elevation and conquered the highest point in this section. The refuge just past the Col appears all of a sudden almost out of thin air, perched on the hillside of the valley you are about to descend providing you are taking the standard TMB route and not the variant route. We didn't make a stop but refreshments are available should you need them and apparently they are pretty good! It's all downhill from here. Literally. Taking the path left of the refuge begins the long winding route to Les Chapieux. Les Chapieux cannot be seen from the top (and can only just about be seen from the bottom!) and there are no signs until you get much further down the mountain. Just as you think there can't be any civilization in the valley, the small hamlet can be seen from the stone bridge that crosses the river. The best thing about Les Chapieux is that the camping is FREE and it is situated in a large field behind the tourist information office, you literally can't miss it. If you do miss it you must be a halfwit. The Auberge de la Nova is large and many people stay and eat there. We met up with our Italian friend from the previous night's camping and made a new friend from Chicago. The best thing about hiking is that you meet so many different people. Les Chapieux just peeping out! Even though we were taking the opportunity to camp for free we still needed to eat. We had the set menu of a three course meal involving soup, beef cheeks, cheese and pannacotta all for €22 per person. We went to bed with full bellies. Can't say fairer than that. Setting off early is the key to any successful hike so we packed up the tent, threw on our packs and gallantly walked to the start of the trail. With only a small divergence into the bakery to buy €1 croissants and a tuna sandwich we set of for Col de Voza, our first milestone for the day and the highest point at 1653m. I consider myself to be a relatively fit thirty year old hiking enthusiast, a middle of the road kind of guy. With that in mind, the first section of the walk is not easy. It is an uphill climb, on a road, for two hours. It's pretty steep at the start, it's pretty steep in the middle and then steep at the end. Nevertheless, it certainly elevates quickly and there are grand views down to the valley where Les Houches is situated. A wonderfully positioned picnic table near the top of the Col is a perfect spot from where you can ravage a recently acquired tuna sandwich. As an Englishman with a terrible hold on any other language except my own I have no idea how to say Bionassay, so I either plump for Beyoncé or Beyond the Sea. However it is pronounced, one can't deny that it is a huge glacier that fills the view for most of this section, slowly luring you in with it's icy, glistening majesty. As well as being a hiking route, the TMB interlinks frequently with a bike trail therefore you can expect to be dodging cyclists at various points along the route. We stopped to talk to a traveling band of of bike enthusiasts who were attempting to ride up a hill far too steep for comfort. I exchanged stories about our routes so far with a German man who had leg muscles the size of Munich. I described how our bags felt like they were filled with rocks and he laughed. With him stretching in his Lycra and I averting my attention from a potential view of a budgie smuggling, he boasted that he was cycling about three million miles a day. After a few minutes of comparisons regarding effort, I had been reduced from feeling like I was conquering Everest to acting like I was complaining about taking a short stroll from the kitchen to the lounge! Not to mention that this guy was in his late fifties and physically fitter than me, our interaction came to an end with his sarcastic comment of 'perhaps one day you'll be a man and get a bike!' I bid the leg-flexing German goodbye and only fleetingly hoped he fell off his bike into a pile of cow dung. This section evens out under foot and passes through two tiny hamlets of Le Champel and La Villette of which the former has a Gîte that is open all year round if you so desire to retire for the night. Passing uniquely built houses with flowers on every corner you would have to do really well not to enjoy this stage of the walk. Nearly all villages along the TMB route and especially the ones in France are accompanied by a spring that continually splashes out fresh, cold water that can be taken advantage of by the thirsty hiker. We stopped here to replenish our bottles. Home of the man who found Neptune! The last slog of day one is generally flat and pleasant with only the occasional hill to keep you in check. After passing through a dense wooded area with copious amount of red ants, the trail brings you to the small hamlet of Tresse which is where Alexis Bouvard was from. If you hadn't heard of him then don't worry neither had I but it turns out he was pretty famous around these parts from 1767-1843. He was the man who discovered Neptune which I found quite entertaining considering by this point the huge bag on my back was telling me that I'd in fact walked to the outer echelons of the solar system myself. Hauling our feet the last mile to Les Contamines which involves a mean uphill struggle right at the end, we were greeted by an aesthetically pleasing, quintessentially French, alpine town. Diving into the local supermarket for much needed sustenance we noticed yet again that this town has lots of amenities for the traveling walker. Whilst we munched on our food we looked up at some of the perfect, wooden hotels and contemplated our next move to find the campsite. The campsite (Camping Le Pontet) turned out to be a 40 minute walk from Les Contamines therefore taking our total to 12.5 miles for the day. At €14 for the night plus the option of a three course meal at the campsite for €15 each we decided that this was the place for us. Having dinner at this campsite I would highly recommend. You are sat round a table with people you don't know and eating enough to keep you full for a week. We sat with an American couple, 3 French blokes and a guy from Italy. Despite the language barrier from our side of the talking block we met some great people who all enjoyed walking, traveling and laughing at my terrible attempt at speaking French. To explain very briefly (and it doesn't take a genius to work it out) the Tour of Mont Blanc is a winding, circular hike around the 15,771ft massif that is the mountain of Mont Blanc. The snow covered, glacier-ridden peak is the highlight of a range that includes some of the most impressive mountains not only in the Alps, but in the world. Much in line with many other long distance hikes, the tour attracts huge numbers of people who aim to traipse the 110 mile (approximately) journey every year. Most walkers who attempt this feat generally stick to the summer months of July and August when the trail can be unbearably overpopulated. Also, the majority of people choose to stay in hotels or refuges for the entirety of their stay. Whilst a comfy bed can ease aching body parts at the end of long walking days it can also hike the price of the trip (no pun intended) to astronomical proportions - a great luxury if you have the funds but not really feasible if you don't. Based on the above, we decided that if we were going to actually enjoy the trail we would have to go in September and if we were going to afford the trip we would have to spend a considerable amount of nights in a tent. The official guide books for the trail are great but they don't go into great detail about camping options, so here is our experience. The view from the Ouibus! Taking a 'Ouibus' from Geneva airport in Switzerland to Les Houches (very reasonably priced at €19 per person) was our choice of transport to the trail. The journey takes about an hour. Les Houches is a sensible starting point situated close to Mont Blanc, five miles south of Chamonix. Along with Chamonix it is probably the most popular spot to begin the anti-clockwise route. We camped for the night in Bellevue campsite on the south entrance to the village from the highway near the TMB trailhead. At €13.50 for two of us we snapped up a spot on the green grass, pitched our tent and went to explore Les Houches. More importantly we went to have our last beer for 11 days; a crazy, addled last minute decision of mine to build some will power! The main street is wonderfully neat and orderly, dotted with a mixture of bakeries, hotels, clothing stores, restaurants and the occasional cheese shop! If a good, cloudy beer and some cracking food is what you are looking for you should go to 'La Delice' where a very smiley English girl will make you feel welcomed. The town has everything you might require before starting a bloody long hike but beware, if you arrive on a Sunday as we did, nearly everything will be shut until late in the day. Fix - Back from the brink! 38 Gold Medals and Prizes' I read to myself, tilting the can to see the rim. 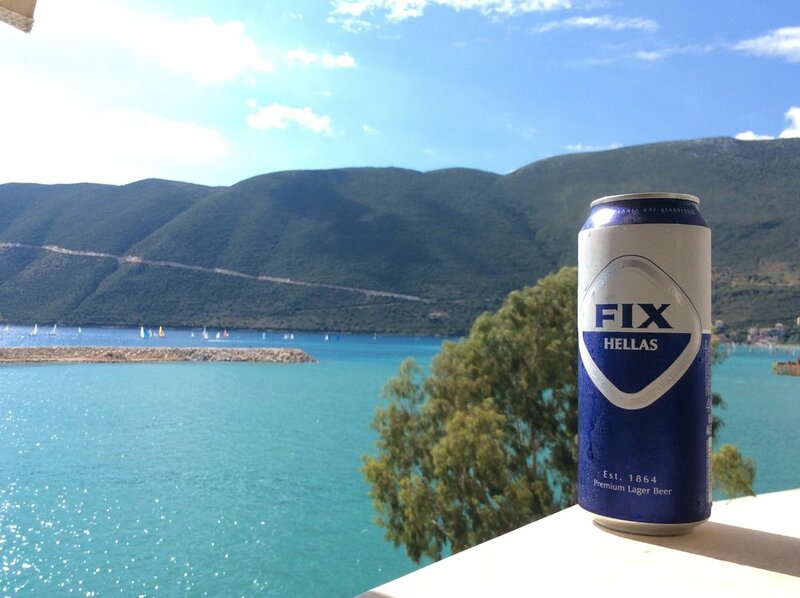 Fix - the premium lager of Greece, back from the brink of obscurity just in time for the current beer revolution. Being familiar with Greece, my dad used to tell me of a time when Mythos, Heineken and Amstel were not the only beers to be found in certain Greek Islands. There was a time when there was a beer named Fix that disappeared some time during the eighties. Never having been old enough to drink at the time, Fix was just a story to me: a beer with a long history and a sad ending. So in 2016, on returning after multiple years away it is a highlight to see Fix available alongside the other major brands in Greece. Fix returned back on the scene sometime during 2009 with the help of three Greek businessmen who could be described as jumping on an opportunity when they saw one. Previous attempts in the nineties to resurrect the historic beer proved fruitless but that was in the age of primitive Internet when it was much more difficult to get word around. Therefore, an investment into an already cherished and well-known beverage was always going to be a winner under the right leadership. To give a brief history of Fix, it is named after Ioannis Fix who is said to have moved to Greece for personal reasons from Germany. Depending on the sources you read he either decided to start making beer to please the German influence in Greece at the time or he simply found himself working in a brewery by chance, only to have the foresight to think 'with a plan and some intelligence, I can compete here.' Whatever the correct story is, one thing is for sure - Ioannis Fix was a man ahead of his time. After a modest start he took off in the 1850's beer scene (whatever that looked like!) By the 1860's, he had moved to new premises to deal with the demand. By the 1890's he had moved again. The beverage named after the man who started it continued to win awards and be a celebrated lager across Greece until well into the 1970's. Unfortunately, a mixture of poor management and the introduction of new beers on the market ended the production of a Greek classic during the 1980's. Just when the lager looked destined for the great beer cemetery in the sky, along came three men with a plan. Since the Fix revival in 2009, this malty beverage, under the guidance of Olympic Brewery has been exported nationally on a huge scale and in some cases internationally as it had before it's sudden demise. On the islands, away from the craft brewers of the mainland, at least there is an option available to rival Mythos and Alfa (made by Heineken!). At least now it is possible to get a lager that doesn't totally fizz your face off at the first sip. Specifications say that it should taste of apples and bananas, I definitely get fruitiness from the bevvy although there is a definite taste of cloves in there. Whatever, I hope Fix continues to be productive, long live Fix, Yamas! Kefalonia is a Greek island in the Ionian Sea which is part of the Mediterranean. There are about a gazillion ways to spell Kefalonia (Kefallonia, Cephalonia, Cephallonia, Kefallinia just to mention a few) and depending on the sources you read, all of them are right/wrong. With that in mind, Kefalonia is a wonderfully aesthetic island that towers from the water with a certain dominance that immediately commands your attention. Approaching from the east it's huge, wild, undeveloped cliffs plunge into the sea like a scene from Jurassic Park. From the air the vast, vibrant greenery hardly seems to reflect the island's intense dry season due to a dense canopy of trees layering the ground as far as the eye can see. To say that it is pretty would be a huge understatement. Being the largest island in the vicinity, Kefalonia holds prime position in an Ionian chain straddled by Lefkas to the north, Zakynthos to the south and tiny Ithaka alongside it, which from above looks like a baby whale swimming alongside it's mother. Landing at any airport is always a bit scary. Even with clear skies and no turbulence I'm always left wagering with the forces that be and saying to them 'if you get this plane down safely I'll be a good boy forever and ever' whilst gripping onto the arm rest so tightly that I'm in danger of cutting off my circulation. Suffice to say, I'm not keen on flying. However, this flight was different. Not only was the weather perfect for flying but the view of Kefalonia appearing out of the haze surrounded by the reflective, bright blue color of the Mediterranean Sea was enough to distract even the most nervous of flyers from hoping the pilot knows where the runway is. Despite the size and ever increasing popularity of the island, Kefalonia's airport is the size of a small box with 'airport' written on it. If you have ever seen the Guinness world record of 'most people in a Mini Cooper' attempt then you can easily conjure up an image of the baggage return room at Kefalonia airport. Being English in a room full of English people only makes matters worse. Normal, well rounded people turn into luggage monsters desperately close to seeking the sun yet held at the final hurdle by a hot, crowded room whose staff work on Greek time (which is approximately 15 times slower than British time). If nothing else, it's entertaining to watch. Hiring a car is easy on Kefalonia and you can expect to pay around €50 a day for a car that is just about big enough to swing around a cat. Deals are offered if you require one for multiple days. As opposed to England but much in line with the rest of the world, Greeks drive on the right, although based on experience you could say they drive in the middle. Taxis overtake on blind corners and scooters carrying anywhere between 1-4 people pretty much just have their own set of rules! Hairpin bends (usually on the side of mountain cliffs with sheer drops) are commonplace and you can guarantee you'll meet a large bus in the most awkward of spots whose driver doesn't slow down but simply speeds up, forcing you to squeeze as close as you can to the edge in the hope of staying alive. As with most of the islands, don't expect clear signage and be prepared to get lost in the backstreets of small towns. With all that in mind it's well worth hiring a car! The views are incredible. Authentic cuisine, home cooking and family run restaurants are standard in lots of Mediterranean countries and it's no different on Kefalonia. You'll find no McDonald's here. No Burger King, no Subway, no KFC, no other huge chain that has managed to take over most of the world. Here you can sit at a modest restaurant by the water, order a full meal and still pay less than the average visit to a greasy counter. As a rule of thumb, main courses cost around €8, starters around €4, beer around €3 and a glass of wine for €1! All in all, you can get a comfortably fat belly for no more than €25. Should you go to the supermarket to buy food, it's even cheaper. Kefalonia has a rich and tumultuous history of being invaded and ruled by different countries over the last 2000 years and it only became part of Greece in 1864. Locals argue that the island was the home of Odysseus which makes it famous for anyone who is a fan of Homer (although not Homer Simpson) and it was the setting for the book/film named Captain Corelli's Mandolin which is based on the Italian/German rule during the Second World War. Whether you want to lie on the beach all day, visit a coastal fishing village or take a hike to an ancient Acropolis, Kefalonia has a lot to offer. The island has an array of beaches with Myrtos beach being one of the most stunning. Aqua blue water that rushes waves onto bright, white pebbles backed by huge cliffs is the stuff of film sets. Lots of the island's building were destroyed in a severe 1953 earthquake with only the most northern town of Fiskado surviving. 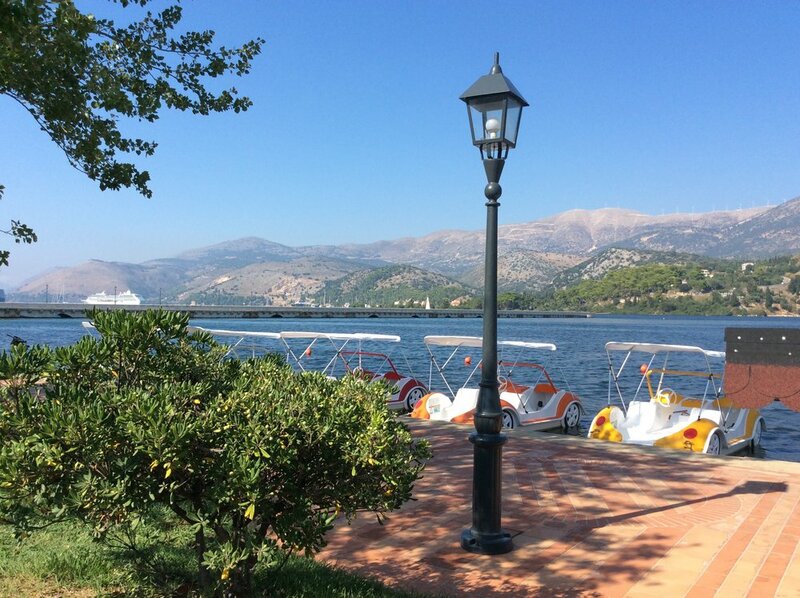 Today it is one of the most traditional, natural harbors on Kefalonia and a great place to visit for a bit of food next to the sea. Unlike so many of the other larger Greek islands, Kefalonia caters for tourists and yet doesn't lose it's character which is one reason why people keep going back again and again. Kentucky Bourbon? Nah, Kentucky Beer! As a beer drinker I'm never hard to please. I enjoy most beers to a certain degree and visiting brewpubs is usually a positive experience. Every individual brewery has something to write home about, little idiosyncrasies that make them unique and fun. Every now and then you find something real special and it's usually somewhere you didn't even intend to go or didn't even know existed. For me, that place is Against the Grain Brewing in Louisville, Kentucky. Man, just about everything in this place oozes skill. The venue is located on the outer echelons of Louisville Slugger Field perfectly accessible from the Main Street on one side and the stadium on the other. It is a brewery, a smokehouse and a superb beer drinking spot. Contrary to the usual brewpub food of bog standard burgers and botched salads the brewery smokes all their own meat. The quality is top notch. What better place to smoke meats than in a bluegrass brewery in the beautiful barbecue land of Kentucky. If the meats don't sway you then the beer will. The brewery makes so many different beverages but only has six beers available at any one time (as far as I'm aware). Even the ones they like, they alter. I'm no beer expert just simply a beer enthusiast but I'm confidently announcing that their 'Pile of Face' IPA is one of the best beers in America. Our server, Stevie P, who was clearly a beer geek like myself revealed that even though I liked it I shouldn't get too hopeful because the guys at the brewery regularly alter the recipes of the beers and alternate the hop varieties! Therefore the beer will always taste different. Judging by the nature of the place I had a feeling that the brewery was run by a bunch of comedians with a penchant for doing things differently. I wasn't wrong. Directing myself to their website (www.atgbrewery.com) and reading through the owners' biographies it was clear to see why I was drinking a beer named 'Pile of Face' that was listed just above 'Sam's sweet BA Dunkel Dunk!' On reading the attributes of the four bearded buddies who brew beer, Adam has been there since the beginning of the universe, Sam has been sent from the future, Jerry was hatched from a silicon-based stone from the planet Phaart and Andrew is a hardened criminal! I guess this must be the perfect combination of personalities to make the best IPA's one could wish for. If that wasn't enough to make you want to visit then to top it all off they have a drink called 'Bieretics' which is salted and smoked in their own smokehouse. Can't say I've had many smoked beers in my time and this one was certainly interesting! If you ever find yourself in Louisville, Kentucky it would be a travesty not to visit Against the Grain. Matos Cheese Factory - Satisfyingly simple! Artisan cheese in California is rife. Come to think of it anything and everything that can be considered artisan, local, home-grown, solar-powered, alternately-lived, organic, sustainable or farm-table-y can be found in California. It's a little overwhelming and can almost make the above words redundant. As a result they lose their significance and it can be difficult to tell what is a trend and what is authentic. With that in mind, sometimes it is refreshing to visit somewhere that keeps things plain and simple. A place where there is no merchandise for sale. A place that doesn't have signage telling you absolutely everything you need to know. A place that doesn't have a Twitter account or an Instagram or even a website. A place that has been making the same cheese for years and yet still only accepts cash or checks. Lots of these locations can be found in other countries but this is the consumer capital of the world so these places are few and far between. One such spot is the Matos Cheese Factory in Marin county, California. The only cheese made at the farm is St. Jorge which is themed on the fromage that comes from the Portuguese Azores. The family, originally from Portugal, have been making cheese on and off since Jack was a lad. All the cheese is made from raw milk and it is available in two stages of aging. How your experience may go? You enter the farm by driving down a long dirt road that passes a variety of cow breeds all chewing on the cud and staring at you. The road ends in a tiny space just enough for three cars. The farm seems deserted and just when you start to ask the inquisitive cows for directions you see a tiny sign saying 'cheese' in a window of a room so small that it looks like it may be home to a family of mice. Almost feeling like you must be in the wrong place you'll turn the handle on the wooden door and enter a miniature space that has nothing in it except a small desk and another door that houses all the aging cheeses. As previously mentioned the company only make one cheese but it is offered at two levels of aging. You should ask the very friendly girl behind the counter to try them both and to see the wheels at their various stages of maturation in the back room. Finally, buying a piece is a good idea - you can get a fairly big wedge for $5 and feed your face with it as part of a picnic. In all honesty, having tried it before I'm not a big fan of the younger version of the cheese but the aged version is spicy, floral and fruity. Not only is it a great tasting cheese but it would be real good grated on top of a pasta dish to add a punch of flavor. Matos factory is open 9-5 daily and amazingly it's part of the official California cheese trail. Unlike Cowgirl Creamery or Marin, don't expect any frills here, just simple cheese tasting with a friendly atmosphere. Lagunitas - Big but still humble? There's no denying it, Lagunitas is huge now. It has just sold half of it's company to Heineken to try and branch into the global market which means it can no longer be described as a craft brewery. Internationally speaking, Lagunitas is still a fledgling but on the national stage it is one of the most well known beer brands in the country. The brewery is massive and trucks line up ready for distribution near and far. Whilst Lagunitas is said to have effectively 'sold out' it still very much feels like a craft brewer. The quality and variation of their beer is excellent and the prices at the brewery are totally reasonable considering its popularity ($5 seasonal's!). It entertains a large brewpub with swathes of outdoor/indoor seating and regular live music from well known artists (Deer Tick, Blind Pilot) to help wash down the large variety of beverages on offer. Familiarity with most of their regular line lent me towards two of their seasonal ventures (Stoopid Wit, Fusion 39), a stout and 'Aunt Sally' which I had never tried. Without delving too much into the individual beers, Fusion 39 is an interesting tipple that's certainly worth a try but for me the Stoopid Wit is spot on. Lagunitas, with their catchphrases and made up words describe this drink as a 'Belgian-ish Wit-ly-esque-ish-ness brew.' Whatever you want to call it, its a summertime drink and it's bloody good. Sitting there in the summer sun under the shade of an umbrella, listening to good quality live music and watching people mingle on the 'mingle tables' it's clear to see why the brewery scene has exploded. From a brewery as large as this all the way to the smallest nanobrewery the object is for punters to enjoy the experience. And people were certainly enjoying themselves here. Providing Lagunitas keeps making great tasting beer then I don't see its expansion as such a bad thing - somebody has to be at the top of the pyramid! Who's got a fat head? Fat Head Brewery is just one of over seventy breweries in Portland. The whole city is soaked in beer. Microbreweries, nanobreweries, brewpubs - you name it and Portland has it. It's difficult to choose where to visit, there are plenty of breweries on the outskirts of town but there are also a whole load of them in the central area too. After visiting one of the 55 food trucks that are permanently stationed in the city and amusing ourselves at the largest bookstore I have ever been to in my life we wandered the streets and decided to go into the first place we found that made beer. That place happened to be Fat Head Brewery. As one would expect, the logo is a cartoon image of a guy with a fat head (who looks incredibly familiar to me). When we got to the bar we immediately got into a conversation with 'Sharon' - a punter. She was incredibly enthusiastic about beer and breweries and told us all of the ones that we should visit in the city whilst also suggesting beers we should try from Fat Head. Feeling slightly uneasy whilst sitting in front of 12 taps that all had a plastic figurine of a fat head staring at me I looked at the extensive beverage menu: coffee stout, IPA, session ales, lager, apricot ale, cinnamon ale! The flavor combinations seemed endless. Not feeling particularly frivolous I wanted the 'Sunshine Daydream Session Ale.' At 4.9% and an IBU of 60 I knew what I was getting and I knew it wouldn't last long! It was so easy to drink and to be honest it tasted a bit like a daydream in the sun...whatever that tastes like. Being more adventurous than me, Haley had a tangerine shandy and whilst I initially turned my nose up at her choice it actually tasted pretty good. In England, people dunk biscuits in tea for a cheeky snack. This drink was like dunking tangerine segments into your favorite ale for an even cheekier snack! We poured the beers into our fat heads for around an hour and then we left for beer-y-er pastures. All in all, lots of fun. Wish I had had an IPA though. Chizu is a pocket sized establishment in central Portland, OR. We had read about it before arriving in the city and we were eager to visit. Essentially it is a bar/eatery that serves cheese, wine and beer all encompassed by a Japanese theme. It's Japanese in the sense that everything in the place is minimalist and it is covered with miniature origami birds. Additionally, Portland receives a lot of visitors from Japan who often pick it as a second city to visit after checking out San Fransisco. The brainchild behind Chizu is the man who also owns The Cheese Bar; a cheese shop in west Portland that has over 200 cheeses. I guess he saw a good business opportunity based on the clientele and therefore Chizu was born. Having now been to Chizu I can confidently declare that it indeed is pretty fun. It's the sort of idea that would work in Portland because the city is so hip it hurts. Hipsters like ideas, specialty food, local product and beer and Chizu has the lot. If Chizu was opened in downbeat country town it would fail worse than a failure who has failed to notice that he had in fact failed. You take a seat at the tiny bar in front of a wide selection of cheeses behind a glass case and pick up a menu that lists all of them on it. It's not restaurant, it's not take out its simply gourmet with a casual feel. You can either choose your own cheese plate and accompanying beverage or you can ask one of the very friendly and knowledgable staff to assist you in making a taste sensation. Our cheesemonger (who turned out to be a relative of Benjamin Franklin!) was excellent. I picked the cheese and she provided the customer experience whilst preparing our cheese board with a selection of dried fruit, salted nuts and crostini. Attention to detail goes into the layout of the boards and just enough cheese is given so that you get a few good bites but not so much that it's overwhelming. Considering the potentially high brow connotations that one may have with the eatery the prices were very reasonable - we had four cheeses washed down with two ciders and we paid $25. The fruit and nuts were part of the deal. I think that's a steal. If we ever go back to Portland, we'll definitely go back to Chizu. Sep 9, 2016 Fix - Back from the brink! Aug 5, 2016 Kentucky Bourbon? Nah, Kentucky Beer! Aug 2, 2016 Matos Cheese Factory - Satisfyingly simple! Aug 2, 2016 Lagunitas - Big but still humble? Jul 31, 2016 Who's got a fat head? Jul 21, 2016 Beer, BBQ and Boots! Jul 14, 2016 Searching for Grizzlies with Huckleberry Wheat! Jul 10, 2016 Banff - Cliffs, Colorful Lakes and Cheeky Wolves! Jul 3, 2016 Good Thunder - Thunderously Good! Jul 2, 2016 The Badlands - Not bad at all! Jun 30, 2016 Fat Tires, Family and Four-Legged Friends! Jun 22, 2016 Trois Pistoles - Petted by a Canadian whilst watching the footy! Jun 20, 2016 The positives of volunteering through WWOOF. Jun 1, 2016 Parmigiano Reggiano: Making husbands worried for nine centuries! May 22, 2016 Roquefort Papillion: Ravishingly Pleasing! May 15, 2016 Fonterra Sharp Cheddar: Your dad's favorite cheese! May 8, 2016 Saint Agur; the rindless, blue wonder! May 2, 2016 What's that Sound? Jan 12, 2016 Super People and Strawberries: Two weeks in Scotland!